Both versions come with source. Mednafen a multi-system emulator has been updated. Fixed a bug that could cause an assert() to trigger under certain circumstances when the scale2x/scale3x/scale4x special scaler is used with SNES emulation. PSX: Fixed a major SPU emulation regression in 0.9.36 that completely broke sample playback on a channel when the playback rate was set near the maximum. PSX: Fixed noise emulation playback frequency calculation(particularly for the lowest noise playback frequencies), per tests on a PS1. It´s unlikely to have any audible effect on games, though. PS1: Experimental save state support(refer to the PSX module documentation for details on how to enable the support which is disabled by default). PS1: Improved MDEC emulation. Fixes lockup problem in a certain corrupt copy of "Dragon Knight 4". PS1: Improved SPU emulation. Fixes sound problems in "WipEout 3" and "Thousand Arms". PSX: Improved accuracy of the GPU framebuffer rectangle copy command(0x80) per tests on a PS1; fixes graphical glitches in the water effect of stage 4 of "Einhander". The NES emulator puNES for Linux and Windows (SDL) has been updated. + ULA+ emulation for all Sinclair and Amstrad models. + Support for all types of 3.5" double sided +3DOS disks. + Raw screenshots now support the ULA+ extension for both saving and loading. + Current ULA+ palette can be changed simply by loading the appropriate ULA+ palette tape files. + Other ULA+ related changes (BMP screenshots, thumbnails, SZX support). + The selected ULA mode as well as the display mode are now part of the config file. + You can now keep your desired custom configuration persistent separately in custom.cfg. * Sector viewer now displays bottom side track addressing info in inverse colors. * Reverted special treatment of full size TR-DOS disks, so padded images work again. * Loading a POK file now automatically shows the poke screen. Pressing Y switches back, as usual. * Reading attributes from unmapped ports on Pentagon now mimics the real hardware mod behavior. * Other subtle emulation accuracy improvements (+2A/+3/Pentagon screen timing, 128K/+2 INT duration). * Many internal changes (optimized screen sampling, optimized contention, async palette switching). * Other subtle changes (UNDO media keeping, CPU stepping prior snapshot save, volume mode order). * Minor bugfixes (media slot release, paths set to root dir, filter in root dir, allowed filter chars). - Super 6-in-1 (KY-6011)[p1][!]. Thanks a lot to MoonWalker for providing this cart! Maybe I have seen it before, but didn't think it's something special. As we can see on its cover, there are some simple games, "TMNT Tournament Fighters" and "Cricket 2003". We are know, that "International Cricket" exists as official game, developed by Beam Software, and as their another game "Aussie Rules Footy", was released only in Australia. But it appears, on this cart isn't a hack of this game, rather an original chinese version of Cricket. - International Cricket (Unl), International Cricket (Unl)(Alt version)[f1]. Actually, there is a dump of this game already available, but this version appears to be slightly different in a lot of cases. Here I put the original dump from the Internet (not mine, if you want to be credited, ask me), and it's Alt version, ripped from the multigame cartridge above and hacked to be able to run in the standalone mode. Also you can see some difference on the screenshots below. Although of visual differences, most probably, the single version is a simplified hack of the Alt version, becuase there is no much difference in the both version's code, just a lot of code was disabled, inluding starting logo, team auto selection and some other things. With all difference, obviously both games are coming from one of numerous portable NES-based consoles with integrated set of a simple original games inside. Both have the same CHR graphics for some kind of advertising screens. Judging from the title screen logo of the Alt version, this is a some of the consoles by "Mitashi". Back to Color by AntonioND for the Game Boy Color! Super Philip is a Game Boy game by Light Games released for the BitBitJam 2014 coding competition. The King Bourbon has abdicated. His son, Super Philip, was heading to the coronation when he had a car accident. Mr. Spartan Escamelrut wants to end with the monarchy killing Super Philip. Thing is a short Game Boy Color Demo by Goblinish. Nice to see people still care about this great Nintendo handheld. Super Mario Kart 8 V1.1 Released! Super Mario Kart 8 V1.1 (PAL) has been released as a demake of Mario Kart 8 on the Wii U, scaling it down on to the original Super Mario Kart for the SNES. If you have downloaded the previous version of Super Mario Kart 8, it is probably the best time to download again and repatch. The project started shortly after the first major course information was released and since then Sarger has been trying to squeeze some of the courses in the game down onto a SNES cartridge. The hack modifies all of the tracks in the game, including the battle tracks, modifies the point system and some of the graphics in the game have been modified as well. Vs. Super Mario Bros. - Home Edition - Version 1.1 Released! Vs. Super Mario Bros. - Home Edition - has been updated to version 1.1! As the name implies, this patch modifies the Vs. Super Mario Bros. arcade ROM to be fully compatible with standard NES consoles, exchanging the physical dipswitches for a pre-game configuration menu and adding high score saving (a feature not present in the original). Paris - Dakar Rally Special now in English! Here is an announcement for an English translation for Paris - Dakar Rally Special for the NES. Now you can enjoy this racing game which involves a different type of game-play for each stage, platforming events, and dodging various enemies from racers, to sea creatures, traps, and military arsenals in order to win. Its a fun little game which offers something different than your normal NES racing title. If you encounter problems test if they also occur in the official supported (Windows, Linux or MacOS X) versions first! In the current state the compatibility is not the best, don't expect that most games work. The program fails to start in 50 Hz mode, use 60 Hz mode until this is resolved. You can report bugs in the Issue tracker. Please check if the bug is resolved in the latest nightly build before reporting. New Super Mario Bros Origins version 1.0 released! The DS scene is giving way to the 3DS hacking, but it doesn't stop the great progress made so far in the DS homebrew and modding scene! SKJmin has released a fantastic remake of the original Super Mario Bros. + Lost Levels based on the New Super Mario Bros engine. Check it out! [source: gateway-3ds.com] We have recently reached a major milestone regarding the 7.x encryption. We can say with certainty that we will soon be running 7.x games and 7.x applications (like eShop, PokeBank and YouTube) in our labs. We can already say that this will be possible with the current gateway hardware and will be supported in the form of a regular firmware update. Some people might think we’re overcautious with releasing new firmware updates and holding stuff back. But we would like to reiterate once again that quality assurance and smooth product experience is on the top of our lists. We really take our time to test everything as much as we can. There’s a bunch of other (interesting) developments going on besides the 7.x encryption fix at the moment; but we will brief you guys about them in a later (more lengthy) news update. Most questions we get at the moment are 7.x related, so this one will be released out as soon as possible. Thank you for your patience once again. Cobra UDE website is launched! Cobra UDE, the Ultimate Drive Emulator for WiiU! We're coming to the WiiU scene, offering the Ultimate Optical Disc Emulator! The Cobra UDE works on all regions and WiiU motherboards. Finally the secret Wii U Browser Exploit is now out in the wild for everyone to enjoy on their Nintendo Wii U Console, if you lucky enough to still be at v4.10 firmware. There been alot of action in the Wii U scene recently, and now the exploit that allows you to do various things, one of them being able to dump key information has been leaked that works on the webkit-based Wii U browser for those still lucky enough on v4.10 firmware. This exploit has been partly blocked on the recently released v5.10 firmware by Nintendo, but with little exploring it should be possible to find the new vectors to get in. There is also rumors that this exploit might even work on the PS Vita or PS4 as they used a similar setup, all tho on the Wii U team fail0verflow mentioned before this is only possible because the NX protection bit is disabled on the Wii U browser system setup. Enjoy! After months of speculation on this disk, hope to have one day. I asked myself dozens of questions about it. The disk is it readable by a normal 64DD? Which version of Super Mario 64 is on the disk; Japanese or American? I finally got my hands on it. I honestly do not know commits the disk was released from Nintendo. Enjoy these photos of this unique piece, probably the only (?) 64DD disk containing Super Mario 64.
thomh @ ck offers " Flappy Bird DS "adaptation of the famous obstacle game Flappy Bird for Nintendo DS. The famous game 'Flappy Bird' lands on your Nintendo DS. Find without waiting Flappy famous in his quest to achieve the ultimate tip! you will achieve it one day? Kippykip and elhobbs offer version 1.4 " DS Doom SVN "Doom port based on the game engine prboom for the Nintendo DS. The project is the result of recovery and DS Doom, originally developed by Wintermute . DsDoom SVN 1.4 Changes: * New menu, still things to add * Fixed the weapon switch with the super shotgun on TNT and Plutonia * Fixed the off-center intermission screen TODO: * Finish the new menu DsDoom SVN 1.3 Changes: * Fixed the icon * Changed the controls - X = Weapon Down - Y = Fire - B = Sprint / Use / Escape on menus - A = Weapon Up / Enter on menus * You can now select the Super Shotgun in Doom2 + * There is now a keyboard on the bottom screen (Cheats do not work for whatever reason atm) You can change weapons with this though Easier * Fixed the high pitched beeps in the music finishes / exchange * Corrected the versions on the first screen * Other minor bugs I forgot TODO: * Bring back the automap * Fix the off-center intermission screen * Make prboom.cfg SAVE DsDoom SVN 1.2 * MUSIC! - Thanks to elhobbs * Fixed bug with hud That small 'Arms' * Single Screen * New icon! BUGS: * The head is on the HUD Slightly buggy by 1 pixel * There is no automap at all now ... oops * Sometimes sounds Will not play if there are a lot of instuments in a song * A ton of other bugs DsDoom SVN 1.1 ! * No more screen scaling Directly It now renders at 256x192! BUGS: * When you complete a map the text is a little off- center. * The 'Arms' on the status bar one pixel off DsDoom SVN 1.0 * Improved the first screen. * WAD Selection. * Original 'Ouch' face bug fixed. Slovobot offers a first draft of " Xonix "adaptation of the famous arcade game" Qix "for the Nintendo DS. It's open source: https://github.com/ruskim/xonix . Could be build for DS and DS Qt build is attached Actually it's a demo project for my students . It's purpose WAS to show 'em how to make easy games on Qt and explain how to separate game logic (engine) from graphical presentation. Goal for fun I added my DS support. I'll be happy if anybody find it useful. Oibaf offers version 12.0 " FBZX Wii "that a new GUI port of the ZX Spectrum emulator of the same name for the Nintendo Wii dowry. In Sliding Blaster by NovaSquirrel you need to collect ammunition, slide around and shoot the enemies. Master the art of sliding and shooting with an arcade feel and unique controls. I have about 6 levels now, out of a planned 10 so there’s more to try out in this build. In addition to that, I finally transcribed the music I composed into the format Tepples’ music engine takes, so there’s music that’s actually different from DABG’s now. I think it might be too difficult currently but I’m not sure. Insect Combat is an attempt to create a fighting game, only using insects instead of people. OK, so I came back to this sooner than I thought I would. Slaying Mantis’s head chomp is now in the game. And do you know what that means? All 8 special moves are in the game now. And you know what else that means? I’m at the point where I need help with opponent AI, which I have no idea how to even think about doing. But not right now, though. I need to take a break. I spent 6 hours working on this. Started at 4am and it’s almost 10am. EDIT: Fixed a glitch that showed up on real hardware. Nestopia Git (2014/07/06) is compiled. This project is a fork of the original Nestopia source code, plus the Linux port. The purpose of the project is to enhance the original, and ensure it continues to work on modern operating systems. Swiss SVN r265 is compiled. The swiss army knife of gamecube homebrew. Swiss aims to be the ultimate utility Gamecube homebrew application. Dolphin Git 4.0-2020 is compiled. This is the trunk of Dolphin Project. Dolphin is the first Gamecube emulator able to run commercial games! Dolphin is a Gamecube, Wii and Triforce (the arcade machine based on the Gamecube) emulator which supports many extra features and abilities not present on the original consoles. It has a partial Wii support and plays most Gamecube games. Pixel-Accurate Plugin for N64 (2014/07/04) is released. It's a MAME-based per-pixel-accurate render plugin for the N64 video interface. DS-Rom Organizer v6.6.0.0 is released. DS-Rom Organizer is a tool for Windows that is designed for making management and organization of your Nintendo DS Games easier. It allows you to easily store your games in the application, view all of its information, organize the way you want, and even get them transferred over to your “Device” with the press of 1 button. * Updated - PSP and PSN Release listings. GameYob Git (2014/07/04) is compiled. GameYob is an open-source gameboy emulator for the DS. It has excellent compatibility and speed, and runs many games flawlessly. Notably, it can use the Gameboy Color bios to colorize pre-color games, just like on a real gameboy. Mupen64Plus-Qt Git (2014/07/01) is released. wxMupen64Plus is a basic cross-platform launcher. This was adapted from CEN64-Qt to work with Mupen64Plus. CEN64-Qt Git (2014/07/01) is compiled. This is a frontend for Cen64 written using Qt. Cen64 is a Cycle-Accurate Nintendo 64 Simulator. DeSmuME X432R (2014/06/29) is compiled. DeSmuME X432R is a modified version of DeSmuME. DeSmuME is an open source Nintendo DS(NDS) emulator for Linux, Mac OS and Windows. DeSmuME supports save states, the ability to increase the size of the screen and it supports filters to improve image quality. DeSmuME also supports microphone use on Windows and Linux ports, as well as direct video and audio recording. The emulator also features a built-in movie recorder. Citra Git (2014/06/28) is compiled. Citra is an experimental open-source Nintendo 3DS emulator/debugger written in C++. At this time, it only emulates a very small subset of 3DS hardware, and therefore is only useful for booting/debugging very simple homebrew demos. Citra is licensed under the GPLv2. Refer to the license.txt file included. * Loader: Refactored loading functions to only read data from binary if called. NCCH: Updated LoadExec to use Memory::WriteBlock function to load binary code. * MemMap: Added a WriteBlock function to write a buffer of data to memory. * ELF: Refactored LoadInto(..) to use memcpy, removed unnecessary code. * Loader: Refactored use of const. * NCCH: Added RomFS loading. * NCCH: Fixes reduce unnecessary logging and load logo/banner/etc. sections correctly. Loader: Added ErrorNotUsed ReturnStatus type to specify when something is not used. * Loader: Implemented AppLoader interface for abstracting application loading. - Various cleanups/refactorings to Loader, ELF, and NCCH modules. - Added AppLoader interface to ELF and NCCH. - Updated Qt/GLFW frontends to check AppLoader ResultStatus. NCCH: Removed extra qualification typos. NCCH: Improved readability of memcmp statements. Elf: Removed unnecessary usage of unique_ptr. Loader: Removed unnecessary usage of unique_ptr. * NCCH: Changed decompression to load .code directly into memory rather than an intermediate buffer. * Elf: Removed unused macros, changed #include of "common.h" to just "common_types.h". * Loader: Cleaned up and removed unused code, refactored ELF namespace. * Elf: Renamed modules to be consistent with new loader naming, fixed tabs -> spaces. * Loader: Added support for booting NCCH executables. NCCH: Fixed typo in printing NCCH filename. * Loader: Moved elf and loader modules to a "loader" subdirectory. * Loader: Added stubbed detection of CXI and CCI files. * Loader: Removed unused CXI and DAT loading code. citra_qt: Removed autogenerated files from repo and fixed build issues. * citra_qt: Removed autogenerated files from repo and fixed build issues. RiceVideo Git (2014/06/27) is compiled. RiceVideo is an open source video graphic plugin for N64 emulators. All windows-based emulators with plugin support (1964, Project64, Mupen64plus). WinDS PRO 2014.06.25 is released. WinDS PRO is a Nintendo DS & GameBoy Advance emulator package. This have NO$Zoomer, NO$GBA, NO$MOOZ, NOZ, myZOOM, NGZoom, NO$GBA 2X, iDeaS, DeSmuME, VBA Link & VBA-M.
Snes9x Git (2014/06/26) is compiled. Snes9x is a portable, freeware Super Nintendo Entertainment System (SNES) emulator. It basically allows you to play most games designed for the SNES and Super Famicom Nintendo game systems on your PC or Workstation; which includes some real gems that were only ever released in Japan. Snes9x is the result of well over three years worth of part-time hacking, coding, recoding, debugging, divorce, etc. (just kidding about the divorce bit). Snes9x is coded in C++, with three assembler CPU emulation cores on the i386 Linux and Windows ports. 3dmoo Git (2014/06/25) is compiled. 3dmoo is an open-source Nintendo 3DS Emulator Prototype. It does not run games (yet). Genesis Plus GX SVN r873 is compiled. Genesis Plus GX is a port of Genesis Plus. Genesis Plus GX is an open-source & portable Sega Mega Drive / Genesis emulator, originally developed by Charles MacDonald, now running on the Gamecube and Wii through libogc & devkitpro. - Use the new core! Fix a typo in the new core. build the ARM pseudo-opcode switch dispatch dynamically in code. DeSmuME SVN r5043 is compiled. DeSmuME is an open source Nintendo DS(NDS) emulator for Linux, Mac OS and Windows. DeSmuME supports save states, the ability to increase the size of the screen and it supports filters to improve image quality. DeSmuME also supports microphone use on Windows and Linux ports, as well as direct video and audio recording. The emulator also features a built-in movie recorder. The Game Boy Color's Pokemon Trading Card Game shows its hand in the 3DS eShop this week in Europe, but there's no word on it coming to North America. The Virtual Console offering is priced £4.49/5 euros and is due for release on Thursday, July 10. 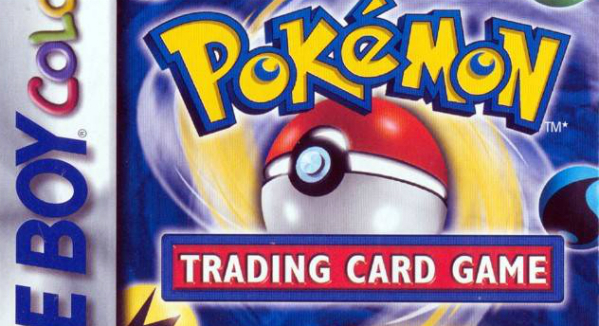 To recap, the Pokemon Trading Card Game is based on the physical trading card game which is based on the video games which aren't based on the anime series but vice versa. We've reached out to Nintendo and The Pokemon Company to see if it's also headed to North America, but we suspect if it's not this week, it can't be too far off. After all, the news arrives just ahead of the new XY - Furious Fists expansionfor the physical TCG, which will add 110 cards to the mix when it hits on August 13. "Celebrate the 25th anniversary of the classic gaming device, Game Boy, by building your own with 3d printing and DIY electronics. This project uses a Raspberry Pi and TFT touch screen to make an epic DIY Game Girl. The 3d printed enclosure houses all of the components and can be printed in your favorite color. It's controlled with SNES gaming controller components, reusing the printed circuit board, buttons and elastomers. The 3D files can be found on Thingiverse, and a video of the finished product is provided as well." The security of Nintendo’s Wii U appears to have been compromised. A speedrunner called MrBean35000vr has a released a video that shows some very basic tweaking of Mario Kart 8 using a web-browser vulnerability, such as the speeding up of in-game music. Fortunately, the hack has already been blocked by Wii U’s most recent firmware update. Those behind it, however, reckon this is a problem that can be overcome. “It has access to read and write memory, the basic library functions, and that's about it,” he said on a web forum. “We can't access the filesystem or likewise install or change anything on it (not that we'd want to since we still have no idea how it works). “When they added the quick boot menu in 5.0.0, it moved a bunch of code around and broke our ROP (Return Oriented Programming) chain that allows us to gain code execution. “So it IS possible to get it working, we just need to find where the addresses are, which is difficult if you don't have any way to see (with the earlier versions we had binaries and so we could see where the code was), so it may take some time. While the vulnerability appears to be limited in scope, any console security exploit increases fears of what may follow – with the end game, despite the protestations of those who evangelise such exploits, often being game piracy. Independent games retailers are now able to sell digital games for Nintendo 3DS and Wii U. The service is being provided by CentreSoft subsidiary DLCSoft, which already lets indies sell digital PlayStation games. Nintendo games will be available from mid-July. A variety of content will be available when it launches later this month, including both 3DS and Wii U titles. Consumers will be able to purchase both full games and digital-only eShop titles. Included in this are some of the retro re-releases such as The Legend of Zelda and Super Mario Bros.
DLCSoft started selling Sony digital codes last November and to date they have been very popular with independent retailers. It was one of the factors in CentreSoft being voted the best high street distributor in last year’s MCV Retail Survey. A SNES-themed backlit Game Boy Advance is being released later this month. The devices, made by Rose Coloured Gaming and spotted by Reddit, aren't official but nevertheless will undoubtedly appeal to the many Nintendo enthusiasts in the market. The new model will be available in both European and Japan friendly SNES and Super Famicom colours, as well as in the US-style grey and purple. They join a large range of custom GBAs, all of which feature backlit displays (which weren't introduced by Nintendo until the Game Boy Advance SP model) and custom lenses. Already available are Zelda: Link to the Past and original Game Boy themed options as well as a host of other colours (we like the Gunmetal Special). Hackers have claimed to have found an exploit in the Wii U system browser which allows them to make small alterations to various assets, but believe that the security hole could enable them to make bigger changes, such as uploading custom tracks to Mario Kart 8. The hack was announced on a 'homebrew' forum over a fortnight ago, but has come to wider attention more recently thanks to a video which shows track names and audio assets being toyed with in Nintendo's racer as well as fonts being altered in the Mii Plaza. However, Nintendo's most recent firmware update, version 5.0, has already closed the loophole which enabled the hack. "The bug is still in the browser, but when they added the quick boot menu in 5.0.0, it moved a bunch of code around and broke our ROP (Return Oriented Programming) chain that allows us to gain code execution," a post from the hacking group on the GBAtemp forum reads. "So it IS possible to get it working, we just need to find where the addresses are, which is difficult if you don't have any way to see (with the earlier versions we had binaries and so we could see where the code was), so it may take some time. "This doesn't work on 5.0.0 since they changed stuff up on us, so first we'd need to port it to 5.0.0, and then our main priority is to start disassembling and looking for an exploit in the kernel which will allow us to do a lot more and allow for homebrew. As for a timeline for when this will happen, probably not anytime soon, since unless we get really lucky, it's gonna take a while to find the addresses for 5.0.0 blind and then finding an exploit in the kernel will probably be even harder, partially because it's a compiled binary and we have to go through the basic assembly which doubles and triples the work versus if we had the source. "For the average person, this does nothing of significance other than it allows us access to basic functions that will allow us to see how the system works. We still need to port the code to 5.0.0 and find a kernel exploit which will allow us full access to the system, and then we need to understand how the system works before we do anything significant. So, we have quite a bit of work to do still." The poster of the YouTube video has reassured watchers that the exploit isn't intended for use as a way to enable cheating or piracy, only the modding of assets like tracks or characters. "Remember guys: We're not going to be encouraging cheating with this and won't let our work be used for it. Our goal is to make game mods; custom tracks, etc. Relax and enjoy what we come up with." Nonetheless, other users have expressed concerns that the exploit will open the game's online modes up to cheating should the methodology be made public. Until now, Nintendo has been pretty successful at maintaining the security of both the Wii U and 3DS with regular updates, having learned a painful lesson from the widespread piracy on the DS. The platform holder has been contacted for comment regarding the hack. Miyamoto laments gaming's "creative immaturity"
Shigeru Miyamoto was not impressed with what he saw from the competition at E3. In a recently published Q&Afrom Nintendo's annual general meeting of shareholders, Miyamoto recapped the company's performance at last month's trade show, then weighed in on the rest of the field. "Every year a number of companies exhibit at E3 and Nintendo is compared with other companies, most likely with Sony and Microsoft," Miyamoto said. "This year, the majority of what the other developers exhibited was bloody shooter software that was mainly set in violent surroundings or, in a different sense, realistic and cool worlds. Because so many software developers are competing in that category, it seemed like most of the titles at the show were of that kind." The Mario and Zelda creator underscored how much Nintendo's lineup of games stood out from the crowd, saying its own efforts were games families could feel safe with. The issue came up again later in the shareholder meeting, when an investor asked about how current turmoil in the gaming industry relates to previous upheavals in other creative media. Miyamoto responded that it was important to learn from other industries, and again reflected on what he saw at E3. "[T]o some, it might have seemed as though there wasn't a wide variety of software at E3, and as though many people followed the same direction to make their video games. I believe this is a revelation of creative immaturity on our part as creators in the video game industry," Miyamoto said. To shed light on why, the designer brought up an observation by former Nintendo president Hiroshi Yamauchi, who said that in entertainment, "only one can become strong and all of the others will become weak." Miyamoto said the quote was meant to describe a phenomenon in entertainment, where one company creates an unprecedented offering, competitors attempt to copy that and customers then go with the original because there's no need to adopt the follow-on efforts. "My comment may be at risk of being misinterpreted, but in the digital content field, I think that our creativity is still immature," Miyamoto said. "In the world of comic books and movies, there are people who are challenging themselves to be even more creative than before in creating their content. I believe that we (those who are creating digital content called video games) are still in a transitional period and will eventually step up into the phases where we expand and enrich the substance of our creativity. If we can manage Nintendo without losing sight of this challenge, I believe we might be able to create new entertainment that dominates the industry." What do kids today think of the Game Boy?The latest episode of The Fine Bros' popular YouTube series Kids React asked just that question.The kids are asked for their first impressions, then asked to pop the Tetris cartridge in and get playing. Then they're shown the magnifier accessory.Most got the Game Boy working. Some liked it, others didn't. The older kids cut it more slack than the younger kids. One thought it was "junk". Another wondered why it couldn't detect your skin and forced you to push buttons. Most thought they'd prefer to play games on their tablets or smartphones.Nintendo's 25 year-old portable gaming device goes down okay, overall, with one kid rightly calling it the grandfather of handhelds.Ah, the good old Game Boy. Things are different now, of course. If it doesn't have a touchscreen and Angry Birds then it makes no sense. - Fix the initial main screen palette which could get messed up on some cards. - Make the mouse help window look like all the other help windows. MoDS Volume 1 is a chipdisk for Nintendo DS released at Solskogen 2014, created by Resistance & Desire. Blake Siefken shows a VHS rip of a cheesy Virtual Boy commercial called "You Have to See It to Believe It". It was also featured (in a slightly shorter version) on the Nintendo Power Preview v11 Laserdisc. Improved console performance and other adjustments the overall performance of the console have been improved and various minor adjustments were made ​​to optimize comfort. Ever wish Game Boys came in a slightly larger size? [John], aka [Bacteria] of Bacman, decided to try something different with this retro console mod — the BigBoy. In case you’re not familiar with the Bacman website, it’s a site dedicated to retro video game console modding — and our hacker, [John] is the man behind the scenes. We’ve shared plenty of their projects before. The BigBoy is basically a Game Boy Advance — with an 8″ display. It uses the electronics from a knockoff copy of a RetroBit in a custom case that [John] vacuum formed at home. He sketched out the proposed outline, built a mold out of plastic sheets and hot glue, and created a concrete dummy mold for the vacuum former — meaning if he ever wanted to recreate this project it would be a piece of cake! [Dan] has been hard at work developing CYNCART to get his Commodore 64 and original NES to play together. We’ve seen [Dan's] handiwork before, and it’s pretty clear that he is serious about his chip tunes. This project starts with something called a Cynthcart. The Cynthcart is a Commodore 64 cartridge that allows you to control the computer’s SID chip directly. In effect, it turns your Commodore 64 into a synthesizer. [Dan] realized that the Commodore’s user port sends out simple eight bit values, which happens to match perfectly with the NES’ controller ports. In theory, he should be able to get these two systems communicating with each other. [Dan] first modified the Cynthcart to send data out of the user port on the Commodore. This data gets sent directly to the NES’ 4021 shift register chip in the second player controller port. The NES runs a program to turn this data into sound on the NES’ audio chip. The first player controller can then be used to modify some other sound settings on the NES. Musical notes are played on the Commodore’s keyboard. This setup can also be used to play music on both systems at the same time. Be sure to watch the video of the system in action below. DSBuff is an excellent application for Window s done in C language that will allow us to perform a number of different operations with our homebrews and backup format. "nds" . Although, even if we were in front of a platform that promised future, the author has made ​​it clear that this is the final version ; but we must not be discouraged with it because has some characteristics of a fully completed project . It is important to note that to use this great application requires NET Framework 2.0 . And another one for 3DS , this time is a classic game that most know, I mean Snake a game remembered and included in the Nokia phones and made ​​us go from boring to fun times, because now everything changes and we can enjoy our 3DS. Following the closure of the Nintendo WFC, ​​we run all our multiplayer Wii games. But that was until a group of developers created the Wiimmfi project , in order to continue enjoying the multiplayer to an alternate server, but this will need to patch the games to work. With Patcher Wiimmfi we can do that easily, whether you have the original game or an ISO of this image. The online is not dead! Humbert Lucas , developer French , brings this new homebrew game with seeking to produce test your skills . Armed with your Wiimote, the objective is to bring the red box to the orange box helping the attraction exercised the green box to the red box . If you hit the wall restart the level. To help you in your purpose you can use the teleporters and arrows . Gearboy Git (2014/07/19) is compiled. Gearboy is a Nintendo Game Boy emulator written in C++. The emulator is focused on readability of source code, but nevertheless it has good compatibility. A lot of effort has gone into this in order to follow OOP and keep it as simple as possible. Dolphin Git 4.0-2227 is compiled. This is the trunk of Dolphin Project. Dolphin is the first Gamecube emulator able to run commercial games! Dolphin is a Gamecube, Wii and Triforce (the arcade machine based on the Gamecube) emulator which supports many extra features and abilities not present on the original consoles. It has a partial Wii support and plays most Gamecube games. 3dmoo Git (2014/07/20) is compiled. 3dmoo is an open-source Nintendo 3DS Emulator Prototype. It does not run games (yet). DeSmuME X432R (2014/07/19) is compiled. DeSmuME X432R is a modified version of DeSmuME. DeSmuME is an open source Nintendo DS(NDS) emulator for Linux, Mac OS and Windows. DeSmuME supports save states, the ability to increase the size of the screen and it supports filters to improve image quality. DeSmuME also supports microphone use on Windows and Linux ports, as well as direct video and audio recording. The emulator also features a built-in movie recorder. Change the stencil test the OpenGL renderer. Problem that some polygons are not displayed correctly will improve. It is a function to run in a one-button FPS change due to Decrease Speed ​​/ Increase Speed. puNES v0.90 is released. puNES is a NES emulator. Currently the program supports mappers 0, MMC1, UNROM, CNROM, and the sound is available. It uses the SDL libraries and it works on both Linux and Windows. Pixel-Accurate Plugin for N64 (2014/07/20) is released. It's a MAME-based per-pixel-accurate render plugin for the N64 video interface. Nestopia Git (2014/07/21) is compiled. This project is a fork of the original Nestopia source code, plus the Linux port. The purpose of the project is to enhance the original, and ensure it continues to work on modern operating systems. HalfNES v0.56 is released. HalfNES is an open-source emulator for the Nintendo Entertainment System, written in Java. Currently, it only runs as a standalone Java SE application. -Fixed loading of large NSF files. -Many other minor fixes over the past year. Wii U owners can proverbially move home from one system to another using a new feature introduced in the latest system update. 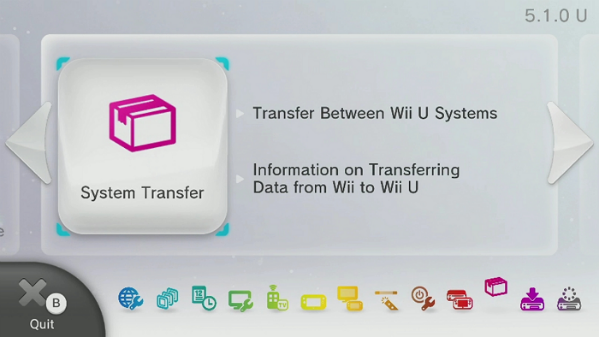 The 5.1.0 U firmware adds "Transfer Between Wii U Systems," allowing you to take all system data - user data, games and saves included - from the original console and move it onto the new one. The most important things you'll need to switch Wii Us are a SD card capable of holding all the data, and both systems to hand, fully updated and each with a GamePad attached. If you don't have your original Wii U, you'll need to contact Nintendo support. Also, be aware the transfer formats the new system before transferring data across, and also formats the original after the process. So when it's over you'll have your new Wii U with all your old Wii U data on it and nothing else, while the old Wii U will be a blank slate. For more info, check out Nintendo's detailed instructions. Finally, if you - like us - get frustrated with having to relocate the GamePad when visiting the eShop, those woes are over now. Yes, the update also introduces eShop browsing using other peripherals including the Wii Remote, Wii U Pro Controller and Classic Controller. It has not happened much since Nintendo released the latest update for Nintendo 3DS and surprise us again with a new , the version 8.1.0-18 for all regions. Among its improvements this update improves performance, system stability and user experience. For now do not seem to have blocked the use of flash cards that worked with the previous version , for now Scenebeta should not upgrade the console to verify that it is support our flash card. Today I present a new emulator for the Nintendo 3DS called 3DNES , as the name suggests is a console emulator Nintendo Entertainment System (NES) . From the first to the existing homebrews Nintendo 3DS includes support MultiROM games. The Earth is in danger and it is your duty to defend . Your mission is to destroy any object that could destroy it and it is not easy , open fire on the asteroids and aliens you find and good luck. The game has a good level of challenge and has a strong resemblance to the big game Asteroids from Atari 2600 . Here is our Wii for the Wii-Tac-Toe , the simple but entertaining game of noughts and crosses . With a very nice interface and the ability to play one or two players, this game will surely spend many idle hours to more than one. Earlier this week, Wii U users receive a notification that Nintendo had released a new update for our console: the version 5.1.0 . This new version seems minimally affects the Wii mode (deleting some cIOS) , but may be reinstated. The improvements brought this new version are quite interesting, so we recommend that you upgrade your Wii U. Fixed loading of large NSF files. Many other minor fixes over the past year. Wizardry Gaiden III - Scripture of the Dark now in English! Announcing Wizardry Gaiden III - Scripture of the Dark is now available to play fully in English! Here it is, the third & last of the Wizardry Gaiden series for the Gameboy. We are hoping to have a release for Wizardry Gaiden IV as soon as the main dialogue is complete so enjoy playing the third one for now! We've been out for a while due to medical issues, but this week we return with renewed passion. We've had to hold off on releasing this weeks issue due to quality concerns with the latter half of the magazine as it suffered from severe printing related problems. So when we finally were able to grab a mint copy, work finally resumed on this issue. And you are able to judge the outcome for yourself as you grab your own copy. So let's get on with it shall we? Our first review is for none other than the top cat-centred platforming game, until Super Mario 3D World came out late last year on the Wii U that is. So without further ado, we present to you: Bubsy! From here we move on to Final Fight 2 and Dracula Kid. Afterwards we look at the interview with Kuniaki Kinoshita from Konami. And finally we go to Chicago for the Summer CES of 1993. One day at Good Will, [microbyter] came across an original Gameboy for $5. Who reading this post wouldn’t jump on a deal like that? [microbyter] was a little disappointed when he got home and found out that this retro portable did not work. He tried to revive it but it was a lost cause. To turn lemons into lemonade, the Gameboy was gutted and rebuilt into a pretty amazing project. Looking at the modified and unmodified units, it is extremely obvious that there is a new LCD screen. It measures 3.5″ on the diagonal and is way larger than the 2.6″ of the original screen. Plus, it can display colors unlike the monochrome original. Flipping the unit over will show a couple of buttons have been added to the battery compartment door to act as shoulder buttons. The brains of the project is a Raspberry Pi running Retropie video game system emulation software which will emulate a bunch of consoles, including the original Gameboy. The video is sent to the LCD screen via the composite video output. The Pi’s headphone jack is connected to a small audio amplifier that powers the original speaker that still resides in the stock location. Connecting the controller buttons got a little more complicated since the original board was removed. Luckily there is a replacement board available for just this type of project that bolts into the stock location, allows the use of the original iconic buttons and has easily accessible solder points. This board is wired up to the Pi’s GPIO pins. Akdul offers version 0.1 of " Jezzball3DS "port of the famous puzzle game JezzBall for the Nintendo 3DS. st4rk offers version 1.1 " 3DNES "NES emulator for the Nintendo 3DS. YourNerdyJoe offers " Chip8-CTRU "port emulator / interpreter Chip8 of st4rk for the Nintendo 3DS. Chip8-CTRU my 3DS is a harbor of GBAtemp user's st4rk Chip8 emulator ... for the 3DS. YourNerdyJoe offers " Shoot's Friend "shooter unpretentious for 2 players for the Nintendo 3DS.
. A simple 2-player game 3ds homebrew Just shoot.3ds could shoot from / onto your SD Card Gateway and run it. Controls: Up / Down - move left player L trigger - left player shoot X / B - move right player R trigger - right player shoot Start - restart game ends Effective Projectiles Either cannot pass through barrier. Independently Barriers move. Shoot at each other Until someone's health hit zero (shown on bottom screen). Artemio Urbina offers version 1.7 " 240p Test Suite "for the Nintendo GameCube port of the utilities comprehensive video tests. GameCube version also allows to test resolutions 480i, 288p, 576i and 480p. Nintendo Wii The Wii version - just as the Dreamcast one - includes more options, aim for the core functions on 240p is the same. No special hardware is needed, order your Wii system must be ble to run homebrew. It uses the framework and SDK have devkitPPC via pure GX calls. It supports the Wiimote, nunchuck, Wii and Gamecube controllers classic, In order to install it, copy the folder to the 240pSuite app folder in your SD card, and launch it from the Homebrew channel. You can use aussi wiiload via wifi. HAS Version This menu option for changing the current resolution, with the Following values: 240p: Standard 320x240 at 60hz is used, with all graphic data'm his resolution. 480i assets scaled 240p (NTSC): This is 640x480i at 60hz, goal using all the resources at 320x240 using internal line doubling. Useful for testing for this case All which is present in Dreamcast and PS2 Many games. Also known as "Fake hi-res" 480i mixed 480p/240p assets (1:1 / NTSC): It is 640x480i at 60hz as well, HOWEVER Some graphics are unscaled and only shown on the upper left corner of the screen (the first 320x240 pixels). Since there is a 1 to 1 pixel ratio as in 240p, tests can be Performed for 480i-interlacers and scalers. . Some test are shown in full 480i,: such as the grid and scroll 480p/240p 480p mixed assets (1:1) with scanlines: Only available When using a component cable. It must be enabled via the options menu as a precaution for not displaying 480p in a not compatible CRT. 480p 240p scaled assets & scanlines: Only available When using a component cable. Internally this is line-Doubled and displayed. It must be enabled via the options menu as a precaution for not displaying 480p in a not compatible CRT. 288p: The progressive variant of PAL 625i line video, It Has All which 312 lines of 288 video lines are active. The Wii can output 320x264p When in this mode. 576i assets scaled 240p (PAL): This displays the 240p patterns in 576i mode. It uses the 480 visible lines, 240 in Each field. The whole of the happy result is linedoubled in this mode. 576i 480/240p assets (1:1 / PAL): It is at 50hz 576i as well, HOWEVER Some graphics are unscaled and only shown on the upper left corner of the screen ( the first 320x240 pixels). Since there is a 1 to 1 pixel ratio as in 240p, tests can be Performed for 480i-interlacers and scalers. Some test are shown in resolution 528,: such as the grid and scroll. In order to help Overcome limitations resolution When in PAL mode, the following 240p adds several options for assessment of PAL modes. Please check the interactive help for details. The software is compliant with composite, s-video, SCART and component cables. Includes libcheckregion Nintendo GameCube This is identiques to the Wii version in terms of features. Artemio Urbina offers version 1.7 " 240p Test Suite "for the Nintendo Wii port its utilities comprehensive video tests. The Wii version also allows to test resolutions 480i, 288p, 576i and 480p. Dolphin Git 4.0-2308 is compiled. This is the trunk of Dolphin Project. Dolphin is the first Gamecube emulator able to run commercial games! Dolphin is a Gamecube, Wii and Triforce (the arcade machine based on the Gamecube) emulator which supports many extra features and abilities not present on the original consoles. It has a partial Wii support and plays most Gamecube games. Nestopia Git (2014/07/27) is compiled. This project is a fork of the original Nestopia source code, plus the Linux port. The purpose of the project is to enhance the original, and ensure it continues to work on modern operating systems. RiceVideo Git (2014/07/27) is compiled. RiceVideo is an open source video graphic plugin for N64 emulators. All windows-based emulators with plugin support (1964, Project64, Mupen64plus). WinDS PRO 2014.07.26 is released. WinDS PRO is a Nintendo DS & GameBoy Advance emulator package. This have NO$Zoomer, NO$GBA, NO$MOOZ, NOZ, myZOOM, NGZoom, NO$GBA 2X, iDeaS, DeSmuME, VBA Link & VBA-M.
3dmoo Git (2014/07/26) is compiled. 3dmoo is an open-source Nintendo 3DS Emulator Prototype. It does not run games (yet). Gearboy Git (2014/07/25) is compiled. Gearboy is a Nintendo Game Boy emulator written in C++. The emulator is focused on readability of source code, but nevertheless it has good compatibility. A lot of effort has gone into this in order to follow OOP and keep it as simple as possible. Citra fix-memory-unaligned-reads Git (2014/07/25) is compiled. Citra fix-memory-unaligned-reads is a branch of Citra. Citra is an experimental open-source Nintendo 3DS emulator/debugger written in C++. At this time, it only emulates a very small subset of 3DS hardware, and therefore is only useful for booting/debugging very simple homebrew demos. Citra is licensed under the GPLv2. Refer to the license.txt file included. * FS: Fix port name (old port name was based on an unaligned memory read). * MemMap: Fix Read32 for unaligned memory reads. FireGB v1.1 is compiled. FireGB is an open source Gameboy Emulator. Fceux SVN r3075 is compiled. FCEUX is a cross platform, NTSC and PAL Famicom/NES emulator that is an evolution of the original FCE Ultra emulator. Over time FCE Ultra had separated into many separate branches. The concept behind FCEUX is to merge elements from FCE Ultra, FCEU rerecording, FCEUXD, FCEUXDSP, and FCEU-mm into a single branch of FCEU. As the X implies, it is an all-encompassing FCEU emulator that gives the best of all worlds for the general player, the ROM-hacking community, and the Tool-Assisted Speedrun Community. Genesis Plus GX SVN r878 is compiled. Genesis Plus GX is a port of Genesis Plus. Genesis Plus GX is an open-source & portable Sega Mega Drive / Genesis emulator, originally developed by Charles MacDonald, now running on the Gamecube and Wii through libogc & devkitpro.